Remarks:	Texas Beach House on the Gulf of Mexico in So Padre Island TX! True Beach Front w/50 ft of frontage. Gorgeous white sandy beach as your back yard. Imagine this as your new home or Investment property. Perfect for Owner Occupant and rent the other 2 units or a full Income property. Turn key, complete w/furniture, linens & utensils. The vacation rental website also conveys. This property has been operating since 1998, the avg yearly income over the past 5 yrs was $141k/yr. Solid repeat Clientele. Still room to expand the business and add more repeat customers. This is a great opportunity that doesn't come along often. Close to parks, restaurants and the new Space X launch site. Interior Features 3 Separate Units, all completely furnished and ready to go. 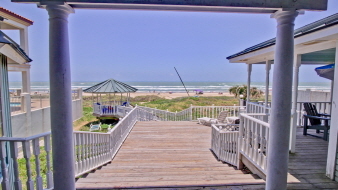 The Texas Beach House is an established vacation rental business since 1998, it is a Turn Key Business complete with it's own website. Exterior Features Beach Front on the Gulf of Mexico!